Winning ground balls was key for Grafton. Algonquin had ended Grafton's season the last three years, and the T-Hawks hadn't lost to a Central Mass foe in two years and three days. That's 37 straight against local competition, if you're counting at home. Still, Grafton's 11-9 victory over Algonquin comes as little surprise for a few reasons. 2. Algonquin has injury issues. 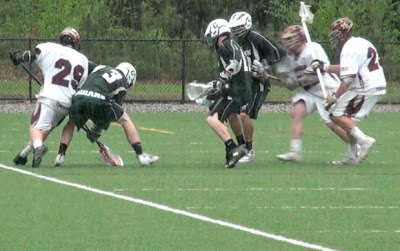 The T-Hawks welcomed back Mike Wood from bruised ribs on attack, but lost midfielder and fill-in face-off guy Mike Ryan to a right knee injury. Tomahawk coach Rich Luongo hopes it's just a bad bruise, but Ryan couldn't put any pressure on his leg as he was helped off the field, and he was down for a while. Add in the fact that Algonquin is still playing without star midfielder Davis Kraft and that they won't get defenseman Sam DiStefano back at all, and the T-Hawks are in a precarious situation health-wise. 3. Grafton needed this win more. Not to say Algonquin didn't really want this one, but they know they can beat the Indians. They got the better of them in the Central Mass title game last year, and in the playoffs the two years prior. Grafton needed to know that they could beat Algonquin so that, if they have to do it in the postseason, there will be no doubt. The Indians seemed to end up with nearly every 50-50 ground ball on the day, and coach Alan Rotatori said that effort was the difference in the game. Ground balls are one thing, but the Indians also won every "pop up" from when a shot or pass got deflected upward. Rotatori was particularly effective in both of those areas, to go with his four goals and one assist. There is clearly a ton of mutual respect between these teams, as both coaches were joking around immediately afterward, and guys from both sides were chatting each other up. Not really much to add to that, just nice to see. So, the team lost, but I've still got something that should put smiles on the faces of Algonquin fans. Former T-Hawk and current Occidental College bro Patrick Walsh made one of the funniest lacrosse videos you will ever see for The Lacrosse Network. In the video, Walsh and some other bro named Brad reenact their favorite lax cellys (lacrosse celebrations). I don't know what's with these Algonquin kids and their viral videos (Always a Good Time), but this one is definitely worth a watch. My personal favorite is the Tusken Raider, but they're pretty much all money. Check it out below.